A brilliantly funny, disturbing, and entertaining visual novel, but the lack of interaction won't appeal to everyone. What is it? A murder mystery visual novel. Makoto Naegi is a completely average student. There’s nothing remarkable about him at all, yet he’s been invited to Hope’s Peak Academy, the most prestigious, exclusive school in the country. He’s one of fifteen talented young people who’ve been hand-picked for their brilliance in various fields, but the only reason he’s among them is because he was randomly chosen in a lottery. Lucky guy! Or not, because Hope’s Peak is hiding a sinister secret. 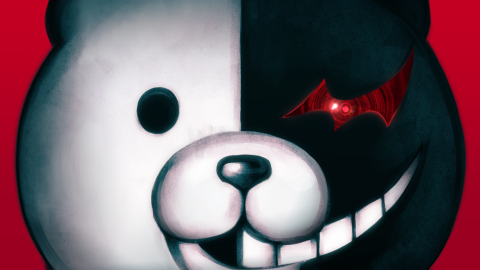 A twisted, mischievous villain called Monokuma, who appears in the form of a mechanical bear, traps the students in the school and forces them to play a sick game. The only way to leave this makeshift prison, or ‘graduate’ as he calls it, is to kill another student in cold blood. And not only that, but the killer has to get away with it too. As far as nefarious plots conjured up by depraved, maniacal ursine robots go, it’s pretty damn evil. Danganronpa is a visual novel, which is a type of dialogue-heavy, largely text-based adventure game popular in Japan. You spend most of your time clicking through dialogue, being told a story rather than taking part in one. But, despite this, it’s really entertaining. Rich, vivid characters, a captivating mystery that’s constantly unfolding in surprising, shocking ways, and a charmingly fun sense of humour make reading through all that text an unexpected pleasure. Your first days at Hope’s Peak are spent getting to know the other students, exploring the school, and trying to escape—a task made difficult by the metal plates bolted on all the windows. They might be the smartest, most talented kids in the world, but they’re a deeply weird bunch with quirks, personalities, and interesting backstories. I grew genuinely attached to some of them, which made the looming threat of one of them either killing someone or being killed themselves extra tense. There’s fiery, charismatic Mondo, the Ultimate Biker Gang Leader. Kiyotaka, the Ultimate Moral Compass, who’s obsessed with rules and punctuality. Sakura, the softly spoken Ultimate Martial Artist, who looks intimidating but takes it upon herself to protect the weaker students. Ultimate Writing Prodigy Toko who has low self-esteem and thinks everyone is judging her. And that’s just a few of the oddballs you’ll encounter at Hope's Peak. Few games offer such a varied, fascinating, and well fleshed-out collection of characters. Inevitably, someone decides to play along with Monokuma’s sadistic game and someone is murdered. The cackling bear explains that if the group can prove who did it, the culprit will be executed. If not, everyone dies. This is when Danganronpa becomes a murder mystery with Makoto reluctantly playing the role of detective. You have to scour the school for clues, gather evidence, interview people, and then make your case in a challenging, fast-paced trial. Trials consist of reaction-based mini-games, most of which involve listening to statements and looking for inconsistencies. When you hear something that doesn’t quite add up you can load a piece of the evidence you’ve gathered that contradicts it—a so-called ‘truth bullet’—into a gun and shoot their words down. You take aim at the offending sentence with a swaying crosshair and fire, which makes Makoto interject and challenge the assertion. Trials get increasingly difficult, throwing in additional elements like barriers of white noise that can block your truth bullets. But there is a ‘gentle’ difficulty setting if you’re only in it for the story. If you make a mistake, like firing a bullet at an accurate statement, you lose health and eventually fail if it drops to zero. But all this means is a restart and a lower score at the end. The final stage of each trial sees you pummeling your faltering suspect with irrefutable evidence in time with the music until they eventually crack. It’s enjoyably silly. When you finally reveal the killer, you’re treated to a grimly amusing cutscene in which Monokuma executes them in a manner relevant to their field of expertise. As more bodies fall, the characters become increasingly paranoid, and so do you. You worry that your favourite character is going to end up dead. And it doesn’t help that Monokuma is constantly providing ‘motives’, like threatening to reveal the students’ deepest, darkest secrets to the world if someone doesn’t die in the next 24 hours. If you take the time to befriend your fellow students between trials, you’ll grow closer to them and unlock special abilities to make your life in court easier—like increasing the time limit or steadying your crosshair. But all this talking means that Danganronpa is an incredibly long, slow-paced game. It can take around 30 hours to finish, most of which is spent reading—they don’t call them ‘visual novels’ for nothing. But it’s a testament to the quality of the story, and the constant desire to know what absurd or disturbing thing is going to happen next, that I didn’t get bored once. Trigger Happy Havoc is actually six years old. It was first released for the PlayStation Portable back in 2010, and has since appeared on a number of mobile formats including iOS. It’s fairly obvious that it’s a port of a mobile game, with slightly fuzzy text and low-resolution visuals. But the detailed, colourful artwork is fantastic, and I quickly got over its technical shortcomings. The characters are static 2D images, but have more personality than the most realistic, motion-captured FPS gunbro. Danganronpa is one of the best story-driven games on PC. The scarcity of interaction, vast quantities of text, and glacial pace will turn a lot of people off, but the story is so compelling that I barely noticed that all I was doing was clicking through lines of dialogue. Monokuma is a deliciously evil villain and the crimes are brilliantly constructed. Just when you think you’ve figured them out, you’ll be blind-sided by some new piece of evidence. If you love adventure games and want to experience something different, Danganronpa is worth investigating.